The New York State Senate is the upper house of the New York State Legislature. There are 63 seats in the Senate, and its members are elected to two-year terms. There are no term limits. The New York State Senate was dominated by the Republican Party for much of the 20th century. Between World War II and the turn of the 21st century, the Democratic Party only controlled the upper house for one year. Following the 1964 presidential election, the Democrats took control of the Senate in 1965; however, the Republicans quickly regained a Senate majority in special elections later that year. In April 2018, The Wall Street Journal described the State Senate as the "last bastion of power" of the Republican Party in the State of New York. On Election Day 2018, Democrats gained eight Senate seats, taking control of the chamber from the Republicans. The following day, The New York Times wrote that the Democrats had "decisively evict[ed] Republicans from running the State Senate, which they [had] controlled for all but three years since World War II." At the beginning of the 2019-2020 legislative session, the Senate Democratic Conference held 39 of the chamber's 63 seats. For more information, see New York state elections, 2008. For more information, see 2009 New York State Senate leadership crisis. Democrats won 32 of 62 seats in New York's upper chamber in the 2008 general election on November 4, capturing the majority for the first time in more than four decades. Previously, the Republicans had held the chamber for all but one year from 1939 to 2008, even as New York turned almost solidly Democratic at all levels. However, a power struggle emerged before the new term began. Four Democratic senators — Rubén Díaz Sr. (Bronx), Carl Kruger (Brooklyn), Pedro Espada, Jr. (Bronx), and Hiram Monserrate (Queens) — immediately refused to caucus with their party. The self-named "Gang of Four" refused to back Malcolm Smith (Queens) as the chamber's majority leader and sought concessions. Monserrate soon rejoined the caucus after reaching an agreement with Smith that reportedly included the chairmanship of the Consumer Affairs Committee. The remaining "Gang of Three" reached an initial compromise in early December that collapsed within a week, but was ultimately resolved with Smith becoming majority leader. At the beginning of the 2009–2010 legislative session, there were 32 Democrats and 30 Republicans in the Senate. On June 8, 2009, then-Senators Hiram Monserrate and Pedro Espada, Jr.--both Democrats—voted with the 30 Republican members to install Senate Republican Leader Dean Skelos (R-Rockville Centre) as the new majority leader of the Senate, replacing Democratic Senate Majority Leader Malcolm Smith. The Associated Press described the vote as a "parliamentary coup". The move came after Republican whip Tom Libous introduced a surprise resolution to vacate the chair and replace Smith as temporary president and majority leader. In an effort to stop the vote, Democratic whip Jeff Klein (Bronx) unilaterally moved to recess, and Smith had the lights and Internet cut off; however, they were unable to prevent the vote from being held. In accordance with a prearranged deal, Espada was elected temporary president and acting lieutenant governor while Skelos was elected majority leader. Following the coup, Senate Democrats voted for John Sampson (D-Brooklyn) to replace Smith as Democratic Leader. On June 14, Monserrate declared that he would once again caucus with the Democrats. This development meant that the Senate was evenly split, 31–31, between the Republican Conference and the Democratic Conference. Due to a vacancy in the office of the Lieutenant Governor, there was no way to break the deadlock. Between June 8 and the end of the coup on July 9, the Senate did not conduct any official business. According to The New York Times, Espada's power play "threw the Senate into turmoil and hobbled the state government, making the body a national laughingstock as the feuding factions shouted and gaveled over each other in simultaneous legislative sessions." The coup also led to litigation. On July 9, 2009, the coup ended. Espada rejoined the Senate Democratic Conference after reaching a deal in which he would be named Senate Majority Leader, Sampson would remain Senate Democratic Leader, and Smith would be Temporary President of the Senate during a "transition period" after which Sampson would ascend to the Temporary Presidency. On February 9, 2010, the Senate voted to expel Monserrate from the Senate following a misdemeanor domestic violence conviction. Espada was defeated in a September 2010 primary election in which the Democratic Party backed his challenger, Gustavo Rivera. The Republicans made a net gain of two seats in the 2010 elections to claim a 32–30 majority at the commencement of the January 2011 legislative session. One Republican Senate incumbent (Sen. Frank Padavan of Queens) was defeated on Election Day, while Democratic candidate David Carlucci was elected to an open seat in Senate District 38 that had been vacated due to the death of Republican Senator Thomas Morahan. Four Democratic incumbents lost their seats to Republicans in the 2010 elections; Sen. Brian Foley was defeated by Lee Zeldin, Sen. Antoine Thompson was defeated by Mark Grisanti, Sen. Darrel Aubertine was defeated by Patty Ritchie, and Craig Johnson was defeated by Jack Martins. Just before the new legislative session convened in January 2011, four Democrats, led by former Democratic whip Jeff Klein, broke away from the main Democratic Conference to form an Independent Democratic Conference (IDC). Klein said that he and his three colleagues, Diane Savino, David Carlucci and David Valesky could no longer support the leadership of Senate Democratic Leader John Sampson. In March 2011, "Gang of Four" member Senator Carl Kruger surrendered to bribery charges. He later pleaded guilty to those charges in December 2011. Following the 2010 census, the Senate underwent redistricting and was expanded from 62 to 63 seats effective in January 2013. When all election night results were tabulated on November 6, 2012, Democrats held a total of 33 seats for a three-seat majority. Democrats gained seats in Senate Districts 17 (where Democrat Simcha Felder defeated Republican incumbent David Storobin), 41 (where Terry Gipson defeated Republican incumbent Stephen Saland), and 55 (where Ted O'Brien defeated Sean Hanna), and won an election in the newly-created Senate District 46. However, on December 4, 2012, it was announced that Senate Republicans had reached a power-sharing deal with the four-member Independent Democratic Conference (IDC). 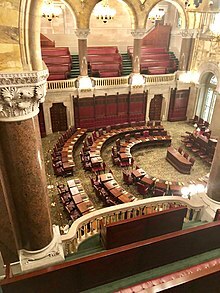 Under their power-sharing arrangement, the IDC and the Senate Republicans to "jointly decide what bills [would] reach the Senate floor each day of the session", would "dole out committee assignments", would "have the power to make appointments to state and local boards", and would "share negotiations over the state budget". Sens. Klein and Skelos also agreed that the title of Senate President would shift back and forth between the two of them every two weeks. Senate District 46 was embroiled in controversy following the 2012 election. Republican George Amedore was sworn in to the State Senate following the election. However, after a recount was completed, Amedore lost by 18 votes to Democrat Cecilia Tkaczyk; this made Amedore the shortest-tenured senator in modern New York history. Amedore would eventually win a rematch with Tkaczyk in 2014. In February 2014, Tony Avella joined the Independent Democratic Conference. Later that year, the IDC announced that it would end its political alliance with the Republicans and create a new one with the Senate Democratic Conference, citing a need "to fight for the core Democratic policies that are left undone." In the 2014 elections, Senate Republicans retook an outright majority in the Senate, The election results meant that Klein lost his position as co-leader, with Skelos taking over as the Senate Majority Leader and Temporary President of the Senate and regaining sole control over which bills would reach the Senate floor. The IDC members decided to remain allied with the Republicans in the 2015 legislative session despite their conference's diminished role. On May 4, 2015, U.S. Attorney Preet Bharara announced the arrest of Senate Majority Leader Dean Skelos (along with his son, Adam Skelos) and the arrest of Assembly Speaker Sheldon Silver. Within days, Skelos announced that he was stepping down as leader of the Republican Caucus and as Majority Leader. Senator John Flanagan, of Suffolk County, became the new Majority Leader, and the first Majority Leader from Suffolk County. After Skelos was convicted in December 2015, his seat was declared vacant, with a special election to be held on the presidential primary of 2016. The special election was won by Democrat Todd Kaminsky, resulting in the Democratic Party having a numerical 32-31 advantage over the Republicans in the State Senate. Despite this, Senator Felder and the members of the IDC chose to remain in coalition with the Republican majority. Late in 2016, Senator Jesse Hamilton announced his intention to join the IDC if re-elected. The IDC aided Hamilton in his first election in 2014, which had resulted in speculation he would eventually join the conference. After all 2016 election results were announced, Senate Republicans lost one seat on Long Island and gained an upstate seat in Buffalo. On Long Island, freshman Sen. Michael Venditto was defeated in a close race by Democrat John Brooks. In Buffalo, the open seat vacated by Democratic Sen. Mark Panepinto (who did not seek re-election) was won by Republican Erie County Clerk Chris Jacobs. Sen. Simcha Felder, who tied for most conservative member of the Senate according to the Conservative Party in 2016, announced that he would continue to caucus with the GOP; Felder's move ensured that the Republicans would retain control of the Senate by a margin of 32–31. Newly elected Democratic Sen. Marisol Alcantara also announced that she would join the IDC, after Klein assisted her campaign. Liberal groups in New York State, including the Working Families Party, called on the governor to intervene and pressure Sen. Felder, the IDC, and the Senate Democratic Conference to unite to make New York a united one-party government in opposition to President-elect Donald Trump's incoming administration. Klein criticized those groups along with Minority Leader Andrea Stewart-Cousins for lack of outreach as well as for calling on the governor to intervene in a separate branch of government. On January 2, 2017, Senate Majority Leader Flanagan and Senate IDC Leader Klein announced the continuation of their coalition. Klein, in a statement to the press, opined that the coalition allowed for the passage of bipartisan legislation and the consideration of pragmatic, progressive ideas. The Republicans retained Senate control with 32 votes, including every Senator elected as a Republican and Sen. Felder. In late January 2017, Senator Jose Peralta announced that he was joining the IDC, expanding the IDC to 8 members, the Republican-IDC-Felder coalition to 40 members, and reducing the Democratic conference to 23 members. On April 4, 2018, the IDC announced that it would dissolve, that its members would rejoin the Senate Democratic Conference, that Stewart-Cousins would continue as Senate Democratic Leader, and that Sen. Klein would become the Deputy Democratic Conference Leader. The announcement followed a meeting called by Governor Andrew Cuomo at which Cuomo requested that the IDC reunite with the Senate Democratic Conference. On April 16, the IDC was dissolved. After the IDC dissolved, the Senate Democratic Conference contained 29 Members, the Senate Republican Conference contained 32 Members (including Sen. Felder), and there were two vacant Senate seats. After two April 24, 2018 special elections were won by Democrats, the Democrats gained a 32–31 numerical Senate majority; however, Felder continued to caucus with the Republicans, allowing them to maintain a 32–31 majority instead. For more information, see New York state elections, 2018. In 2018, five Republican senators--John Bonacic, Tom Croci, John A. DeFrancisco, William J. Larkin Jr., and Kathy Marchione--announced that they would not seek re-election in the fall. In the September 13, 2018 Democratic primary elections, all eight Democratic senators who had been members of the IDC at the time of its dissolution faced challengers. Six of the challengers prevailed. John Liu defeated Avella, Robert Jackson defeated Alcantara, Alessandra Biaggi defeated Klein, Jessica Ramos defeated Peralta, Zellnor Myrie defeated Hamilton, and Rachel May defeated Valesky. Carlucci and Savino won their respective primaries. Another Democratic incumbent, Martin Malave Dilan, was also defeated by a primary challenger (Julia Salazar, a self-described democratic socialist). On November 6, 2018, the Democratic Party gained eight seats and won control of the State Senate. Democratic challengers defeated incumbent Republican Sens. Carl Marcellino, Kemp Hannon, Martin Golden, Terrence Murphy, and Elaine Phillips and won races in three districts (Districts 3, 39, and 42, respectively) in which Republican incumbents had not sought re-election. The mainstream Democrats won 39 seats, a decisive majority. In total, enrolled Democrats won 40 of the chamber's 63 seats. Felder offered to rejoin the Democratic Conference, but was turned down. Stewart-Cousins was formally elected Majority Leader and Temporary President on January 9, becoming the first woman to hold the post. Catharine Young challenged Republican leader John Flanagan in a post-election bid for the minority leader position, losing 14–9. She resigned her seat effective March 11, 2019. The Lieutenant Governor of New York is the ex officio President of the Senate. Like the Vice President of the United States, the Lieutenant Governor has a casting vote in the event of a tie, but otherwise may not vote. With few exceptions, the Senate is presided over by the Temporary President, a post which is normally also held by the Majority Leader. The Senate has one additional officer outside those who are elected by the people. The Secretary of the Senate is a post that is chosen by a majority vote of the senators, and does not have voting power (he/she is allowed, though officially discouraged, from discussing and negotiating legislative matters). The Secretary of the Senate is responsible for administering the Senate's office space, overseeing the handling of bills and the oversight of the sergeants-at-arms and the stenographer. The position is currently held by Alejandra Paulino, who was appointed in December 2018. ^ Felder is an enrolled Democrat. However, as of January 2019, he is not a member of the Senate Democratic Conference or the Senate Republican Conference. ^ The 57th District seat is vacant due to the resignation of Catharine Young. ^ The "IDC" abbreviation stands for Independent Democratic Conference. ^ The "SF" abbreviation stands for Sen. Simcha Felder. Felder is an enrolled Democrat who caucused with the Senate Republican Conference from 2013 through 2018. However, as of January 2019, he is not a member of the Senate Democratic Conference or the Senate Republican Conference. ^ "Branches of Government in New York State". New York State Senate, A Guide to New York State's Government. New York State Senate. 1988. Archived from the original on September 23, 2008. Retrieved April 23, 2009. ^ Hamilton, Matthew; Karlin, Rick (January 8, 2015). "Session begins, lacking drama". Times Union. Retrieved January 16, 2015. ^ "FBI: Senator embezzled, lied". Retrieved February 8, 2018. ^ "Todd Kaminsky Win of Skelos' Seat May Not Be Enough to Shift State Senate Control to Democrats". Archived from the original on January 10, 2018. Retrieved February 8, 2018. ^ "Senator Hassell-Thompson joins Cuomo administration in NYS State Homes and Community Renewal". Retrieved February 8, 2018. ^ "Democrats Win New York Senate Races". Wall Street Journal. April 24, 2018. Retrieved October 23, 2018. ^ a b Wang, Vivian (November 7, 2018). "Democrats Take Control of New York Senate for First Time in Decade". The New York Times. Retrieved December 19, 2018. ^ a b Campanile, Carl (November 7, 2018). "Democrats take control of NY state Senate for first time in a decade". New York Post. Retrieved December 19, 2018. ^ a b McKinley, Jesse; Goldmacher, Shane (November 7, 2018). "Democrats Finally Control the Power in Albany. What Will They Do With It?". The New York Times. Retrieved November 12, 2018. ^ 2008 Election Results, New York State Board of Elections. ^ New York Times. "Democrats Take State Senate." nytimes.com. November 5, 2008. ^ Peters, Jeremy W.Democrats Likely to Keep Control of State Senate, The New York Times, November 6, 2008. ^ Lanza, Michael. Smith Balks After ‘Gang of Three’ Talks Archived December 22, 2008, at the Wayback Machine The Queens Tribune December 11, 2008. ^ Hakim, Danny (February 8, 2018). "Democrats Reach Pact to Lead New York State Senate". Retrieved February 8, 2018 – via NYTimes.com. ^ Peters, Jeremy W. (February 8, 2018). "Democrats Take Control of New York State Senate". Retrieved February 8, 2018 – via NYTimes.com. ^ a b Hakim, Danny (July 9, 2009). "Albany Impasse Ends as Defector Rejoins Caucus". The New York Times. Retrieved November 12, 2018. ^ BAUMAN, VALERIE. "NY judge tosses Senate case back to lawmakers". Press-Republican. Retrieved January 10, 2019. ^ "NY Senate votes to expel Hiram Monserrate". longisland.news12.com. Retrieved January 10, 2019. ^ Dolnick, Sam (September 15, 2010). "In N.Y. Legislature Races, Espada and Monserrate Lose". Retrieved January 10, 2019 – via NYTimes.com. ^ a b "Johnson to appeal ruling of Martins victory". Newsday. New York. December 6, 2010. Retrieved January 7, 2012. ^ "New York State Legislature Election Results". The New York Times. ^ Thomas Kaplan; Nicholas Confessore (January 4, 2011). "4 Democrats in State Senate Break With Leaders". The New York Times. ^ Weiser, Benjamin (2012-04-26). "Carl Kruger Sentenced to Seven Years in Corruption Case". The New York Times. ISSN 0362-4331. Retrieved 2018-05-11. ^ "New York State Legislature". Retrieved January 10, 2019 – via NYTimes.com. ^ a b c d Roy, Yancey (December 5, 2012). "Skelos praises his Senate deal with Dems". Newsday. Retrieved October 22, 2018. ^ Kaplan, Thomas (November 13, 2012). "Newly Elected State Senator, Simcha Felder, Defects to G.O.P". Retrieved February 8, 2018 – via NYTimes.com. ^ Kaplan, Thomas Coalition Is to Control State Senate as Dissident Democrats Join With the G.O.P., The New York Times, December 4, 2012. ^ Lovett, Kenneth (April 15, 2013). NYS Senate Independent Democratic Conference To Busted Malcolm Smith: Stay Away. New York Daily News. Retrieved April 16, 2013. ^ "John Sampson, Once a State Senate Powerhouse, Sentenced to Prison". The New York Times. 2017-01-18. ISSN 0362-4331. Retrieved 2018-05-11. ^ Ariel Zangla (November 5, 2014). "46th NY Senate District: George Amedore ousts Cecilia Tkaczyk". DailyFreeman.com. Retrieved January 8, 2018. ^ "Avella's defection strengthens Senate coalition". Albany Times-Union. February 26, 2018. Retrieved March 27, 2018. ^ Bain, Glenn. "Senate's Independent Democratic Conference announces end to alliance with Republicans – UPDATED". New York Daily News. Retrieved February 11, 2015. ^ "GOP wins N.Y. Senate, puts Women's Equality Act in flux". Retrieved February 8, 2018. ^ a b "Klein, diminished but still desired, sides with power". Capital New York. Retrieved February 8, 2017. ^ admin (March 21, 2016). "Jeff Klein's wild ride". Retrieved October 22, 2018. ^ "GOP takes full control of NY Senate, but retains 'coalition' with Valesky, IDC". The Post-Standard. Syracuse, New York. Retrieved February 8, 2017. ^ Craig, Susanne (May 4, 2015). "New York Senate Leader and Son Are Arrested on Corruption Charges". The New York Times. ISSN 0362-4331. Retrieved January 2, 2017. ^ Kaplan, Thomas; Craig, Susanne (May 11, 2015). "Dean Skelos, New York Senate Leader, Vacates Post". The New York Times. ISSN 0362-4331. Retrieved January 2, 2017. ^ Rashbaum, William K.; Craig, Susanne (December 11, 2015). "Dean Skelos, Ex-New York Senate Leader, and His Son Are Convicted of Corruption". The New York Times. ISSN 0362-4331. Retrieved January 2, 2017. ^ Rojas, Rick (January 30, 2016). "Special Election Is Set for April to Fill Seats Left Vacant in Albany". The New York Times. ISSN 0362-4331. Retrieved January 2, 2017. ^ "Brooklyn senator joins breakaway Democrats". Retrieved February 8, 2018. ^ "Jesse Hamilton promises to join Senate's IDC". Politico PRO. Retrieved January 2, 2017. ^ "Republic state Sen. Venditto concedes race to Democratic challenger". News 12 Long Island. Archived from the original on January 3, 2017. Retrieved January 2, 2017. ^ "New York Conservative Party". ^ Yee, Vivian (November 21, 2016). "Simcha Felder, Rogue Democratic Senator, Will Remain Loyal to G.O.P." The New York Times. p. A25. ISSN 0362-4331. Retrieved January 2, 2017. ^ "Alcantara's primary win a major victory for Senate IDC – NY Daily News". Retrieved 2017-01-03. ^ "Alcantara wins race to replace Espaillat, bolsters IDC". Retrieved 2017-01-03. ^ Lovett, Kenneth (January 2, 2017). "LOVETT: Breakaway Senate Dems will side with GOP". Daily News. New York. Retrieved March 16, 2017. ^ "NY Senate Legislative Session 1-4-17". Retrieved 13 January 2018. ^ "Sen. Jose Peralta blasts 'failed' state Democratic leadership". Retrieved February 8, 2018. ^ a b Goldmacher, Shane (April 4, 2018). "Democrats in New York State Senate Reconcile After Years of Infighting". The New York Times. Retrieved April 4, 2018. ^ Wang, Vivian (April 16, 2018). "As Session Resumes, a Democratic Truce in Albany Seems Uneasy". The New York Times. Retrieved April 16, 2018. ^ "IDC agrees to dissolve". Retrieved April 4, 2018. ^ Campbell, John; Spector, Joseph (April 24, 2018). "Simcha Felder to stick with Senate Republicans, denying potential Democratic control". Rochester Democrat & Chronicle. Retrieved April 24, 2018. ^ Precious, Tom (May 3, 2018). "Fifth GOP state senator in a week announces retirement plans". Retrieved January 10, 2019. ^ Bayside-Douglaston. "NY Election Results: John Liu Ousts Tony Avella In Senate Primary | Bayside, NY Patch". Patch.com. Retrieved September 14, 2018. ^ Hallum, Mark. "Ramos upsets Peralta in Democratic primary". TimesLedger. Retrieved September 14, 2018. ^ Prospect Heights-Crown Heights. "Zellnor Myrie Wins Crown Heights State Senate Race | Prospect Heights, NY Patch". Patch.com. Retrieved September 14, 2018. ^ Parsnow, Luke (September 13, 2018). "In stunning upset, Rachel May defeats Dave Valesky in state Senate Democratic primary". WSTM. Sinclair Broadcast Group. Retrieved September 14, 2018. ^ Lieberman, Steve (September 13, 2018). "Carlucci defeats Goldberg in Democratic primary for 38th Senate district". The Journal News. Gannett Company. Retrieved September 14, 2018. ^ Wang, Vivian (September 13, 2018). "Democratic Insurgents Topple 6 New York Senate Incumbents". The New York Times. The New York Times Company. Retrieved September 14, 2018. ^ "Julia Salazar overcomes controversy to notch another victory for democratic socialists". Vox. Retrieved 2018-09-14. ^ "New York Election Results". November 6, 2018. Retrieved January 10, 2019 – via NYTimes.com. ^ Lombardo, David (December 31, 2018). "Wayward state senator not welcomed by Democrats fold". Times Union. Retrieved January 10, 2019. ^ Precious, Tom (January 9, 2018). "After 242 years, a woman is in charge of the State Senate". Buffalo News. Retrieved January 10, 2018. ^ a b "Senate Leadership". October 4, 2015. Retrieved February 8, 2018. ^ Coltin, Jeff (December 11, 2018). "Some surprises as Senate Democrats announce committee chairs". City & State.